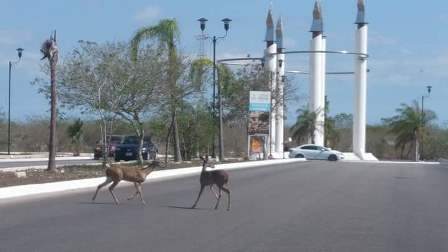 Yucatan’s Secretary of Urban Development and Environment (Seduma), Eduardo Batllori Sampedro, acknowledged that the presence of wild animals in Merida’s suburban developments has become common, because their territories have been occupied due to the growth of the city. According to the state official, this situation has occurred mostly in the northern part of the city, in suburbs such as Altabrisa and Las Américas, where recently residents reported two deer wandered the streets of the area. In that sense, he mentioned that it is important that the neighbors generate a healthy coexistence with the animals, avoiding at any cost to affect them or to cause them harm. “When they see any wild animals they should not treat them wrong, on the contrary, they must take care of them, avoid running over them or throwing stones at them,” he said. He said that the main reason for their presence is that the area where they live has been deforested to give way to new housing developments so they are forced to enter urban areas, although he made clear that this is not a problem. On possible attacks on people, he said that these will not occur unless they are caused some damage, because it is an animal’s reaction to defend itself. He recommended that in any encounter with a wild animal, it is preferable to report it to the Profepa, Semarnat or Seduma, so that specialists go to the site in question to capture and later relocate the animal to avoid injuries or damages.